Tactical Operations never seems to be satisfied with what they have, or with just resting on their laurels, and as such, they continue to improve their rifles and their other products that they manufacturer. One of these products is their drag bags. Some may recall that I reviewed their original drag bag several years ago and you can read that review here. I still use that bag and it has held up very well, but I had heard they were coming out with a new version of the bag and I thought I would do a write up on the new bag, as I have wanted a larger bag to carry my Bravo (KATE) with the suppressor attached. I ordered up a new bag in the “coyote brown”, which is a limited edition run of brown colored bags they have in stock right now. The cost is $295 which is on the high end of the drag bag offerings out there, but certainly not out of line when comparing to other high quality bags. Tac-ops made a number of improvements to the bag, none of which are “earth shattering” but they do all add up to make a better product. One of the things they improved was the sturdiness of the material and especially the construction, with more stitching in most all areas, especially in high stress areas like the handles. 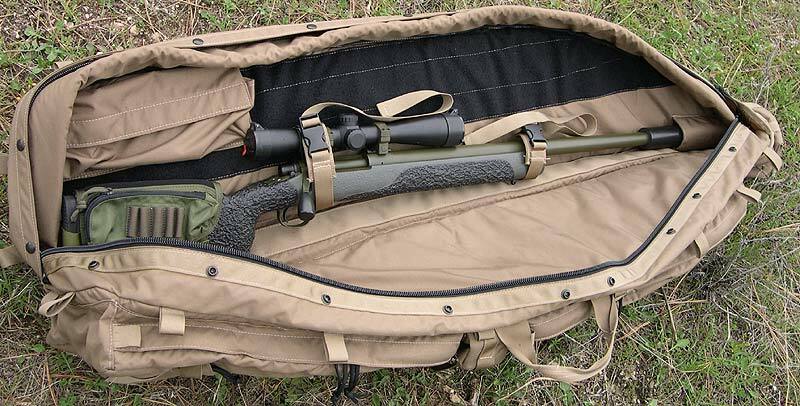 These handles were also redesigned and relocated to better hold the rifle and case balanced when the proper bag size is selected for your rifle. Many of the features on the old bag are still the same on this new series of bags, like the shooting matt, shoulder straps, internal pocket for your cleaning rod (down the spine) etc. So the previous review does still apply to this bag also. One major and noticeable improvement was the replacement of the “D” rings on the shoulder straps with a square ring. The reason this was done was because the “D” rings were found to not be holding the shoulder straps in place and they were twisting up and generally causing a headache. The square rings prevent that and work great so far. 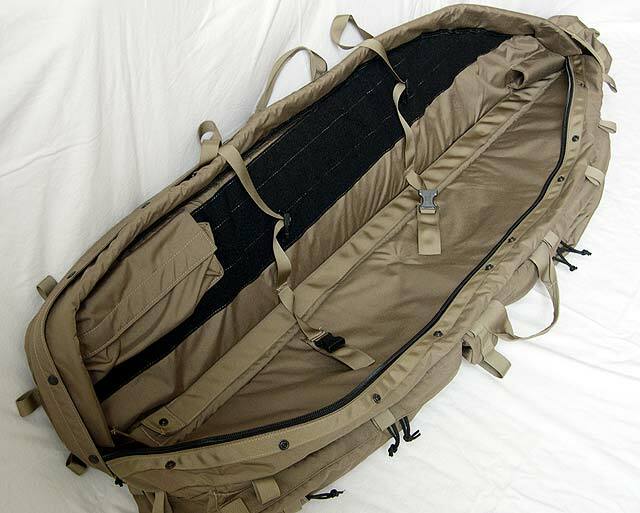 There are two sizes of bag, one built for the 24″ barrel length rifles, and one sized for the big bertha rifles. I ordered one of the “howitzer sized” cases, as Tac-Ops likes to call them, and the size turned out to be just about perfect. My bravo has a 22″ barrel (measured from the front of the receiver, about 23″ if measured from the actual start of the barrel like most manufacturers measure) and it is threaded for a suppressor. The suppressor is 8″ long. 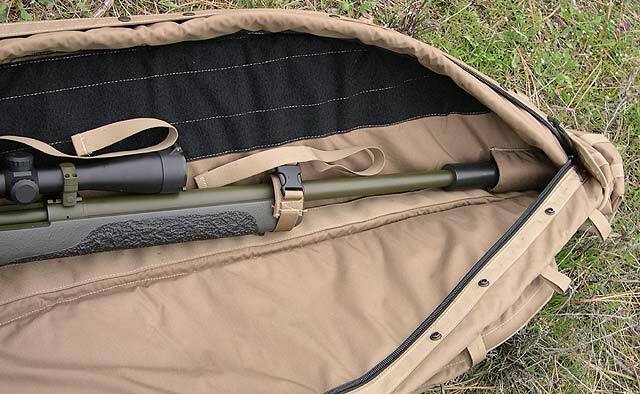 The overall length of my Bravo is 49″ with the suppressor attached, and I have about 1.5 – 2″ of extra room in the bag with the suppressor attached and the rifle strapped in. The muzzle protection pocket inside is actually sized for a suppressor, but works fine on just a barrel also. 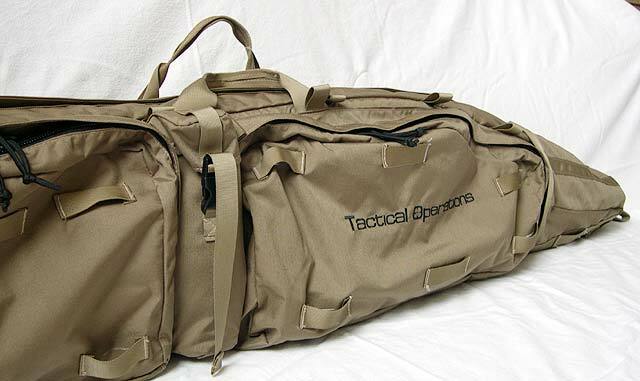 There have always been suppressor pockets on the outside of the Tac-Ops bags, but it has now been redesigned with a cover over the top of the pocket, and the removal of the drain eyelet at the bottom of the pocket to prevent any possible marring of the suppressor while the bag is being drug around with the suppressor in the pocket. One other really noticeable difference is the physical size of the outside rear pocket; it is about 6″ larger than previous. Some of this is do to just the larger size of this bag, but I confirmed with Tac-Ops that this pocket was significantly enlarged on all bags, both large and small. One other minor improvement I noticed was the replacement of the actual grip portion of the YKK zippers with just a bit of 550 cord. It is just an added bit of cleanness to the overall product. All other functionality and quality of the bag remained on par are better than the previous version of the bag and I see no reason why this bag will not serve me as well as my previous one, which will still see extensive use. Tac-Ops, keep up the product improvement, we all appreciate it! Nice OD Cerakote job on the barrel since first review. Does this bag have a D Ring for hooking up a “drag cord” I typically drag off my riggers belt ring with a cord to my bag.